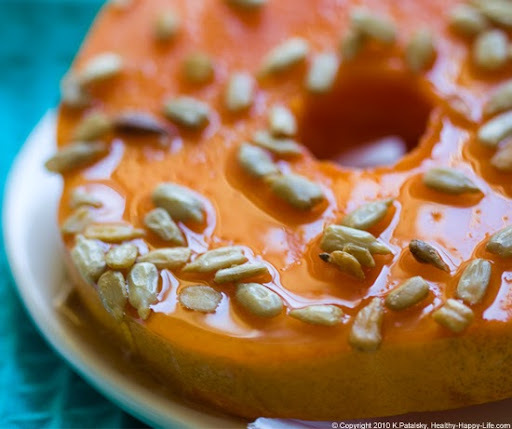 Papaya Doughnuts, Lime Agave, Sunflower Sprinkles! 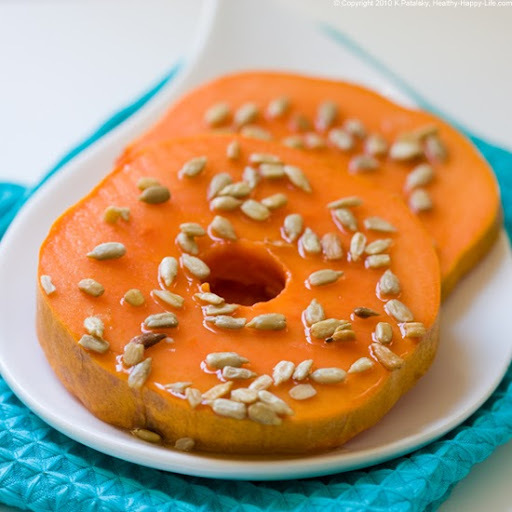 Bust your doughnut craving by trying my yummy Papaya Doughnuts with Sunflower Seed Sprinkles and a Lime-Agave Drizzle. Super fun and super delicious. Those Aren't doughnuts! Not really. More like Fruitnuts. But they are 100% guilt free doughnut-looking treats. Use your imagination and your happy tastebuds will be all you need to make this recipe again and again. 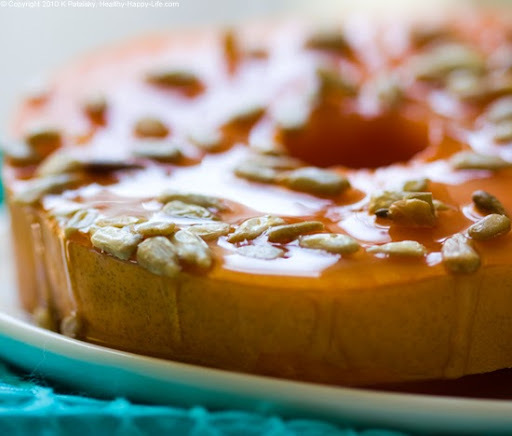 Serve this fruit breakfast dish to your favorite kid - big or small. No Papayas or Sunflower Seeds on Hand? That's OK. You can make a craft out of this dish by using assorted seed sprinkles and different "doughnut" fruit slices. Try peaches, apricots, pineapples, grapefruit, mangoes, melons or apples. If they don't have a natural hole - simply punch one out with a narrow glass or cookie cutter. And you can even make apple or pineapple ring doughnuts too! Simply remove the core instead of scooping the seeds. Any other doughnut ring fruits you can think of?? Get creative! 1. Wash the skin of your papaya in cool water or with veggie was very well. 2. Slice the papaya in half and scoop out the seeds. 3. Slice the halves into 3/4-1 inch thick rounds. 4. 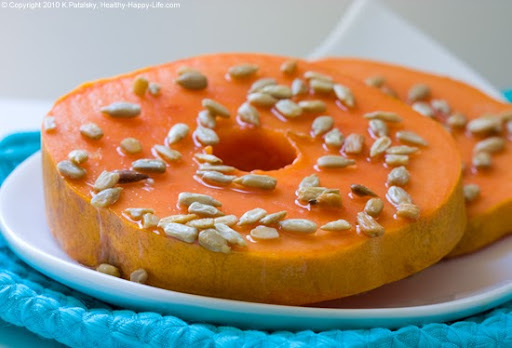 Squeeze lime juice over top the papaya rounds. Position on serving platter. 5. 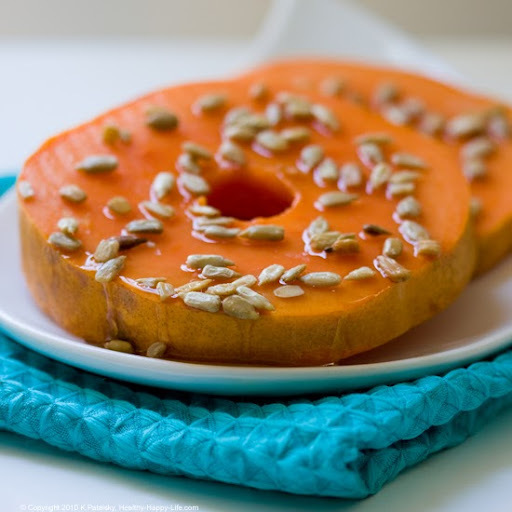 Drizzle agave syrup over papaya rounds. Sprinkle plentiful sprinkles on top. Serve the doughnuts! No dunking allowed...Eat with your hands for maximum fun-factor. ..this makes a perfect weekend fruit recipe for a brunch spread. So much fun. And trust me, delicious.